It is a category of devices that are attached to outside the mouth to provide forces to correct the position of teeth or modify jaw growth. Most of these appliances use a harness behind the head to provide an anchor for forces on the jaw and teeth. 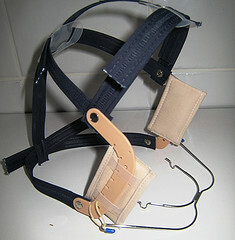 The harness can restrict lower jaw growth by being attached to a cup on the chin. Other attachments can be on to teeth that have full or partial banding. Orthodontic forces need an “anchor” in order to move or change anatomy. Often in the mouth it is the molar teeth or an opposing arch of teeth. However, if the molars need to be moved backwards then external anchorage may be needed. They are usually worn for limited time per day. They make a stunning fashion statement! A hook, peg or lug attached on a tooth to enable orthodontic forces. For this item no. to apply the tooth is a malpositioned erupted (exposed) tooth. The force can be applied by removable or fixed appliances. The item is not used for a surgical exposure of an unerupted (not exposed yet) tooth. This is item no. 392.